1 thomas the tank engine pinata. This Thomas the Tank Engine Pinata is chugging its way into your next Thomas party, bringing a box car full of fun. 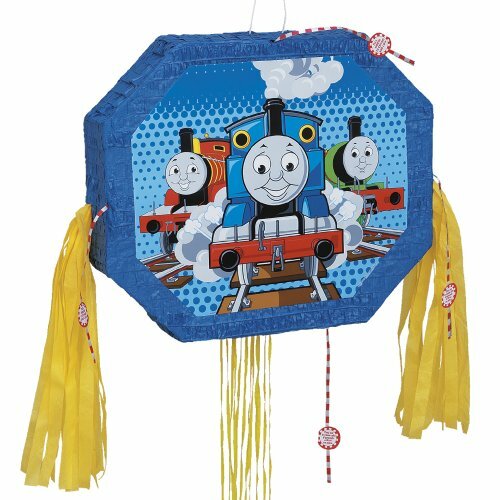 Party guests will sound their horns with glee as our Thomas the Train Pinata showers them with tasty candy and Thomas party favors. Simply fill this party pinata with 2lbs of your own candy and other goodies and have little ones take turns pulling the attached strings to reveal the treats inside. Use this Thomas the Tank Engine Pinata in the classic party game, or as a fun train party or Thomas the Tank Engine birthday party decoration.